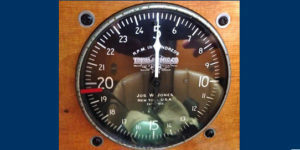 The tachometer in our bird is original equipment, and the same as the one used by Charles Lindbergh when he flew across the pond. The classic art deco Travel Air Manufacturing Company logo is silk screened on the face for all to see. It reminds us, every time we set the power, that we’re really flying a time machine, an exquisite historic artifact from the past.